Any organization that depends on data to better serve their customers, streamline their operations and lead their industry will benefit from a cloud data warehouse. Unlike massive, traditional data warehouses, the cloud means businesses big and small can size their data warehouse to meet their needs and their budget, and dynamically grow and contract their system as things change from day-to-day and year-to-year. Nearly all of a company’s data is stored in a multitude of disparate databases. The key questions to ask are: How accessible is that data? How much will it cost to extract, store, and analyze all of your data? And, what will happen if you don’t? This is where data warehousing comes into play. 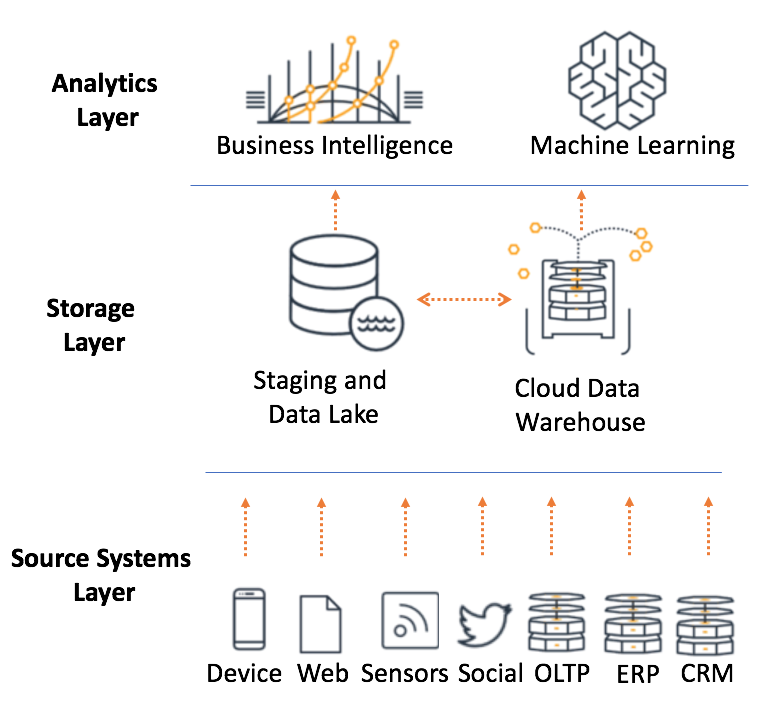 Rock Your Data delivers cloud data warehouse solutions for clients across a wide spectrum of industries and fully rock their data and analytics in order to transform their business. what customers are doing with cloud data warehouse? When you’re in the market for a data warehouse, a checklist of criteria will help determine which alternative best meets your needs. why customers choose cloud data warehouse? Fully managed with a pay-as-you-go model. Works on any data. Supports the tools millions of business users already know how to use today. Reduces complexity with the built-in performance so there’s no infrastructure to tweak, no knobs to turn and no tuning required. Direct, governed and secure data sharing within seconds so enterprises can easily forge one-to-one, one-to-many, and many-to-many relationships. Data warehousing has been rethought and reborn in the cloud for the modern, data-driven organization. Find out how you can challenge the status quo and become an IT champion that creates the future, giving users the benefits they dream of with data warehousing built for the cloud. Take the next step toward writing the next chapter of your organization’s data warehousing history. looking for a cloud data warehouse solution?